A small team investigate reports of a man-eating giant crocodile. 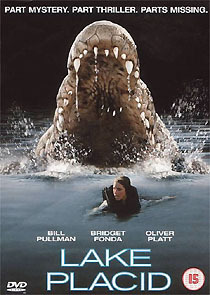 The review quoted in one of the three TV adverts on Fox’s Lake Placid disc calls the film “This year’s Anaconda”, as if the company thought that that was a good thing. Thankfully Lake Placid is no Anaconda. Clocking in at a smidgeon less than 79 minutes, Miner’s lean film wastes no time, and moves like a well-oiled machine. The story is nothing special, but the film benefits from interesting characters, and actors that are obviously relishing the snappy dialogue given to them in the script, which was written by Ally McBeal creator David E. Kelly. Fox’s disc contains a terrific letterboxed 2.35:1 anamorphic transfer, and Dolby Digital 5.1 audio (at 384kbps). The “featurette” turns out to be a five-minute promotional piece that features the usual mix of sound bites and clips, but it also includes a couple of shots showing how the special effects - a blend of Stan Winston animatronics and Digital Domain CGI - were accomplished. The disc also contains badly designed biographical profiles of the key cast and crew members, which don’t seem to have been updated since the disc hit American retailers’ shelves, way back in January 2000. Watch out that you don’t accidentally get a rogue copy of the UK Rental release, which is horrendously pan-and-scanned. The Region 1 disc is non-anamorphic.